Cadillac Plating Corporation has been in the plating business for over sixty years. We specialize in zinc and zinc alloy plating with seven automated rack plating lines to serve our customers. Cadillac Plating Corporation is able to provide a service to its customers in the automotive industry that is second to none. This success is achieved through the help of a labor force rich in experience. Zinc and Zinc Alloy Plating with seven automated rack plating lines! Zinc plating is a valuable tool when used to combat the corrosion of steel. The zinc corrodes before the steel does, sacrificing itself for the benefit of the steel. Much has been written in recent years about replacing environmentally hazardous Hexavalent chromium electroplating solutions with Trivalent ones. Electrochemically, alloys can be designed to produce different corrosion characteristics than their alloying elements. Our Plating Specifications is a small list of the plating specifications that Cadillac Plating Corporation currently offers. For other plating specifications, please contact us at any time. Cadillac Plating Corporation is a full service company. Not only offering plating solutions, but also offering secondary operations to meet the needs of our customers. Cadillac Plating Corporation recognizes that consistency in their activities provides customers with the quality of product that is necessary to promote customers’ confidence and continued growth. Cadillac Plating Corporation recognizes that consistency in their activities provides customers with the quality of product that is necessary to promote customer confidence and continued growth. It is the corporate policy of Cadillac Plating Corporation, to provide this consistency in order that mutual support and benefit is obtained. This will ensure that the products are suitable for their intended purpose and supplied at the most economical level to achieve customer satisfaction. The company recognizes that the stated quality objectives can only be met by a process of continuous improvement of the business operations and the quality management system in relationship to changing circumstances. 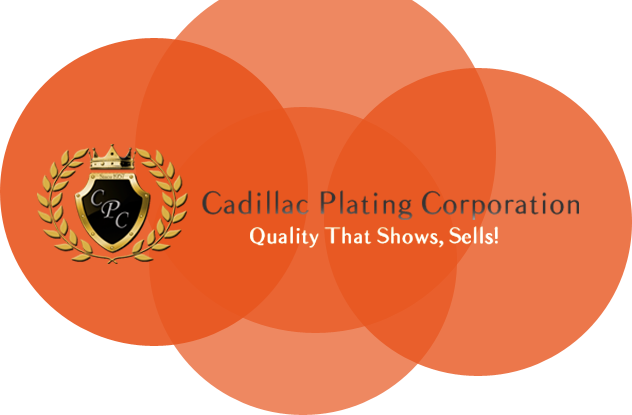 Cadillac Plating Corporation started plating in 1957 with 1 plating line. Over the years we have expanded to 7 automatic rack plating lines producing several different processes on 70 million parts a year. We specialize in zinc and zinc alloy plating using the latest trivalent systems. Our proudest achievement is the ability to turn product within 24 hours of receiving it. Cadillac Plating Corporation is able to provide a service to its customers in the automotive industry that is second to none. This success is achieved through the help of a labor force rich in experience.